I love easy recipes that are make-ahead and get better with time. I love/hate desserts that I enjoy so much that I strategize all day about which moment will be the one that I will open the fridge and cut myself a slab… and moan as I eat. If you relate to two or more of these above declarations, then you might need to make this cake! I am typically biased towards layered cakes and bundt/tube cakes. They are so beautiful and special and lovely on cake plates. 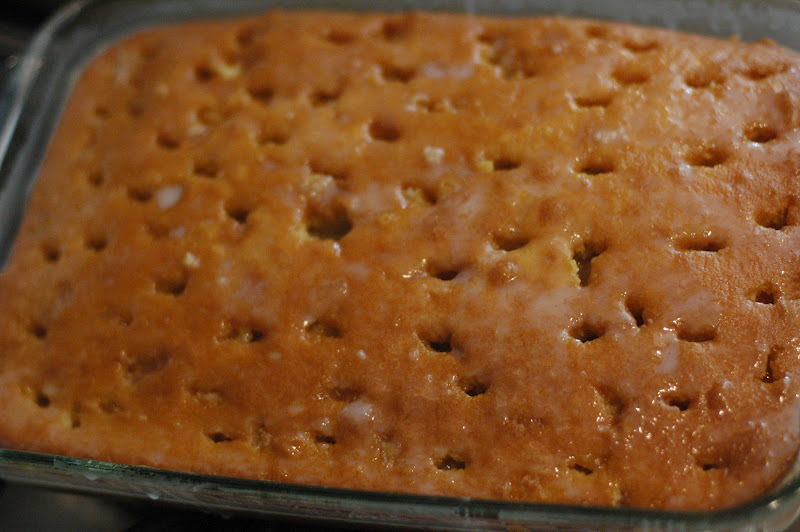 However, kind of like the Texas Sheet Cake I wrote about recently, you just get over that when you taste it. This cake can’t be made in layers. It just won’t work. It is poked with holes, which are then filled with goo, and soaked, and covered with whipped cream. This needs to happen in a pan. 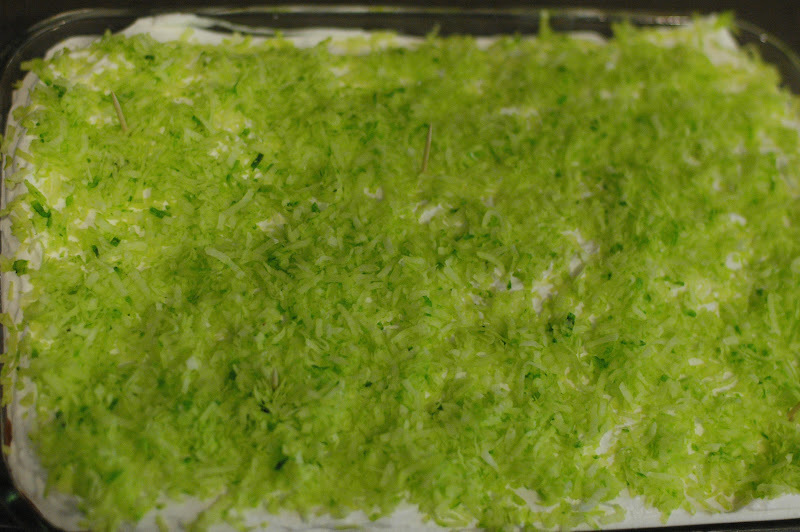 My friend Gretchen introduced this cake to me a decade ago and she called it Cold Coconut Cake. I like the “Cold” in the title because it describes it well, since it is kept in the fridge and the coldness is a defining characteristic of this dessert. Their family has made it for years. I talked to Gretchen’s mom the other day and she told me that the recipe was originally made with a chocolate cake and with chocolate syrup and condensed milk poured over. They got the recipe from Aunt Linda. Then they began experimenting with the recipe. They tried a caramel version and then Gretchen suggested to her mom to make it coconut! 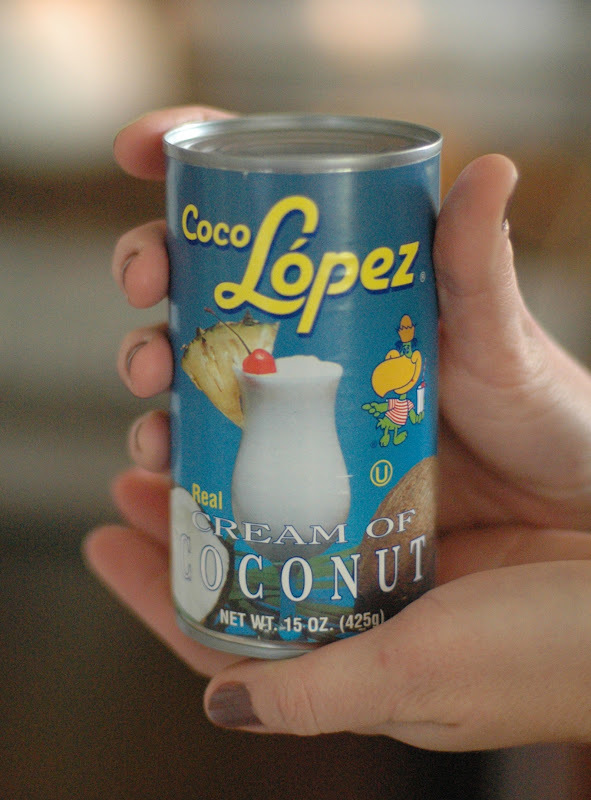 She brought her a can of cream of coconut (Coco Loco) and the rest is history! This Coconut Cold Cake came into being! And we are glad. Dave had not historically been a fan of coconut, but after tasting this cake, he was converted. This is one of his very favorite cakes. It has a can of Cream of Coconut in it, as well as the coconut on top. One time when I was making it, he requested that I leave the coconut topping off of 1/2 of the cake (HIS side, we’ll call it). And I did. And, low and behold, he declared, that he actually missed the coconut! It was a breakthrough moment. As I was getting excited about his newfound appreciation of coconut, he took a little of the wind out of my sails and said, “maybe just a little sprinkling of coconut would be good”. So, I try to go light on the coconut topping in honor of him. At least on his side. 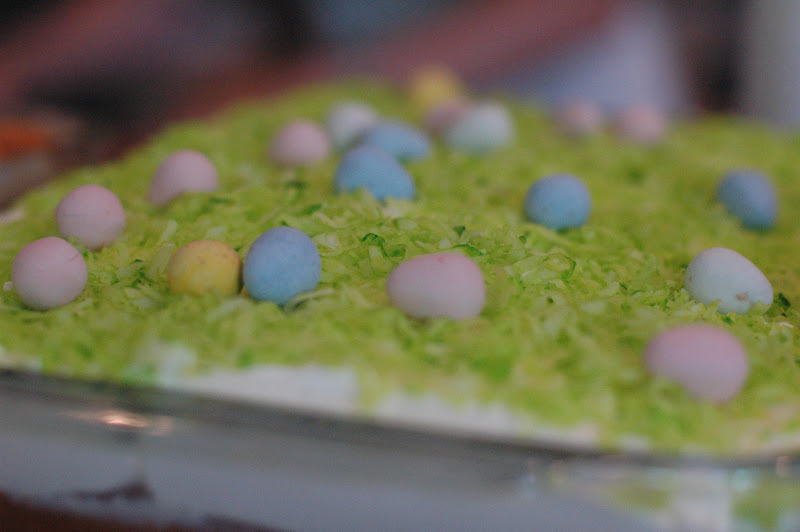 We began making this for Easter years ago because coconut is so Easter-y. I started dying the coconut green for grass, and placing little egg candies on top for fun. It’s become a tradition. I now make it every year. Dave and I love knowing, if at no other point in the year, at Easter, we WILL HAVE this cake! As far as the candy eggs: I sometimes use Cadbury Chocolate Eggs (those lovely solid chocolate, candy coated eggs with the matte finish) because they are pretty and yummy and my favorite Easter candy. However, jelly beans taste better when eaten with the cake. You can do what you like. P.S. 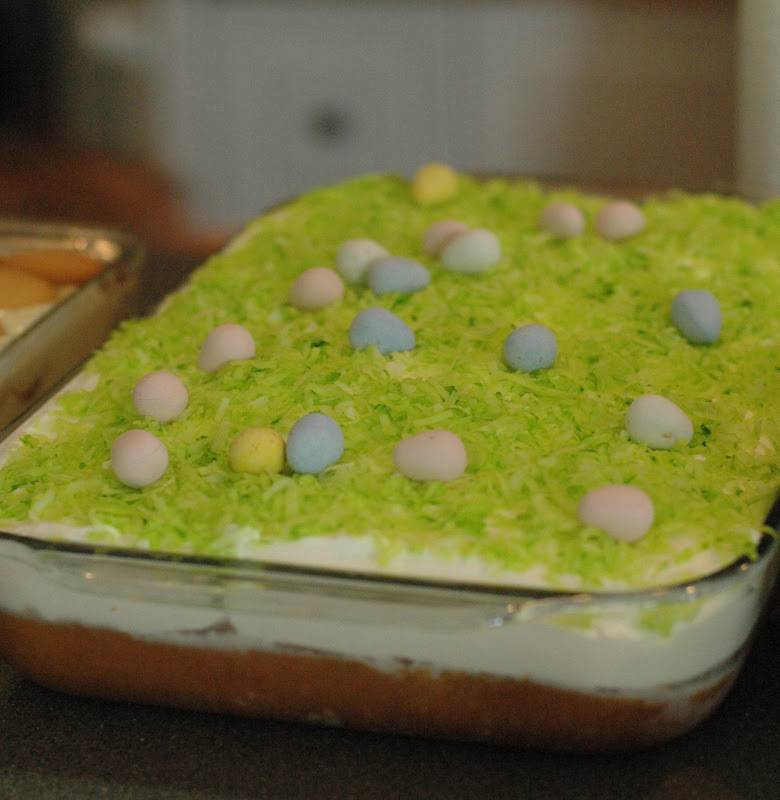 I took these photos last Easter when I was making the cake, but it was too late to post it for Easter. So I just kept them in a folder on my computer, thinking I would just post it this spring. As I told Dave that I was thinking about posting about Coconut Cake this week, he got excited assuming that this meant that I was going to make one this week, so that I could photograph it. He was sorely disappointed when he realized that I already had last year’s photos and he was going to have to wait a few weeks before having one at our house. I’m telling you, it’s that yummy. 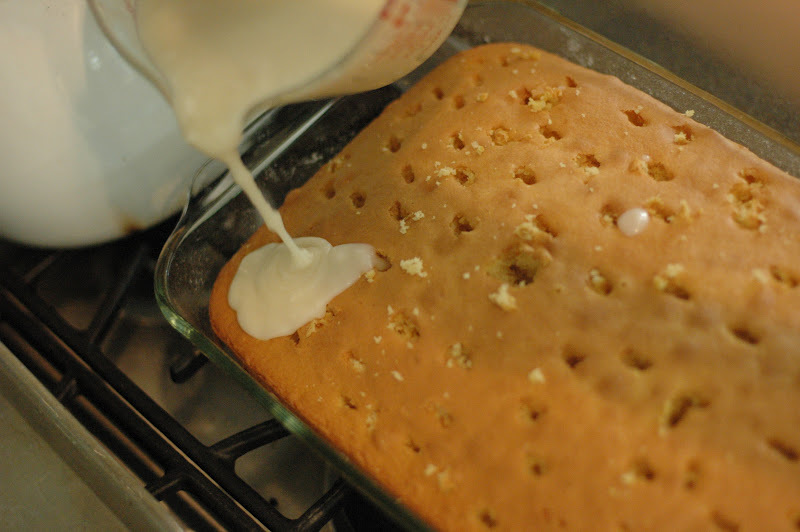 Another great attribute of this cake is that it is better on day 2 or 3 than day 1… as the liquid soaks into the cake and it becomes moist and wet and amazing. This is helpful for a holiday meal because you can prepare it early and be done! Make yellow cake as directed on box. 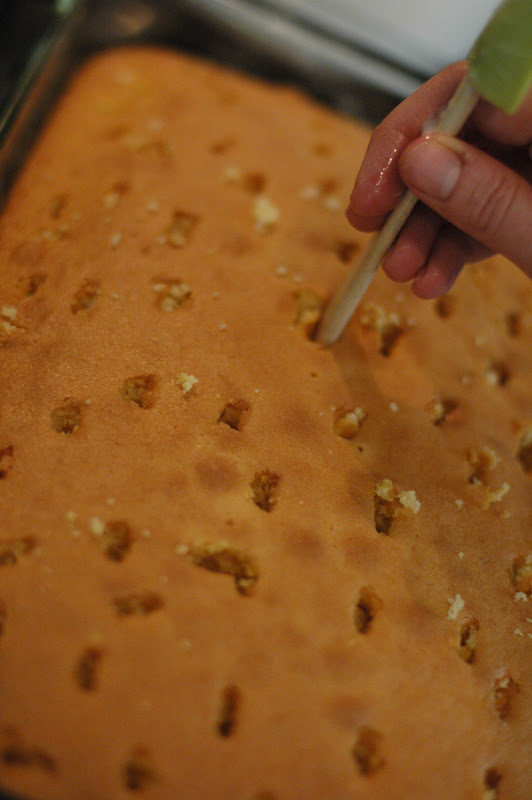 After the cake cools for a few minutes, poke holes in it with the end of a wooden spoon (or something similar). Mix together condensed milk and cream of coconut in a batter bowl or large liquid measuring cup, then pour evenly over the cake. Top with whipped cream. (Make whipped cream- See HERE for directions). OR you can use Cool Whip – thawed, of course), but I love whipped cream so much and it’s far more real (ingredient-wise) than cool whip! Refrigerate for at least 3 hours, then serve. Keep refrigerated before and after serving. 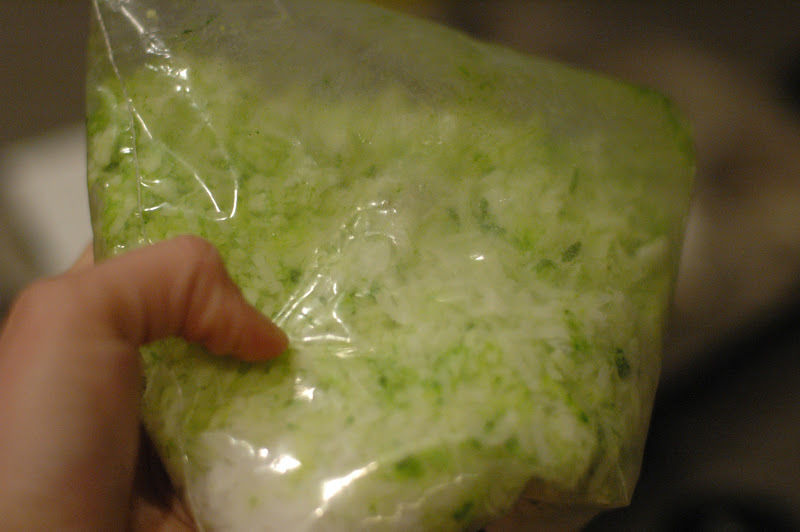 To color coconut, put it in a ziplock bag along with a few drops of green food coloring and a few drops of water – then mush around with your hands until fully incorporated. You might need to make a practice cake this week… to make sure you like it enough to serve it for a holiday meal. At least that’s what Dave thinks we should do! Main dish ideas for Easter Dinner coming soon! This sounds great! I'm a fan of cakes that absorb tasty goodness. It's easy to make, but not easy to wait!” At least we gain a day or two with this one! Actually, I have eaten your cake, and it is DELICIOUS! I think it might be an understatement to say this is my favorite cake. I love it so much – I'm just like Julie – it's good for every meal – breakfast, lunch, dinner, snack, morning snack . . . . YUM.